I can’t remember the last time there was a good prison movie, but this is excellent stuff. A brutal study of the prison system and whether people can be truly rehabilitated, or indeed if we even do enough to help rehabilitate. The film begins with Jack O’Connell’s Eric Love being placed into prison, and for the duration of the film we’re never far from his character. He’s clearly a troublemaker and immediately attacks a fellow inmate for no apparent reason, and the guards who try to restrain him. We’re introduced to Rupert Friend’s care worker, who wants to help, and we find out more about Eric’s upbringing and the fact that his father, Neville (Ben Mendelsohn) is serving life in the same prison. None of these characters are particularly nice people, but consideration is given to the reasons that have led them down a path that ultimately ended in jail. Jack O’Connell is a revelation in the central role, tough, feral and violent, and he controls the screen in every scene he’s in. Ben Mendelsohn is one of the best character actors around and he’s excellent as Eric’s dad, a questionable role model who ultimately cares about his son. There’s a strand about corrupt prison officers that isn’t fully fleshed out, but plays an important part towards the end of the film, and several other tough characters in key supporting roles. 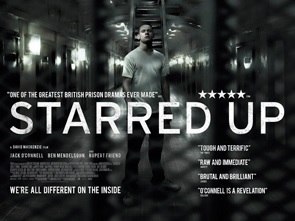 This is an excellent tough and gritty prison movie, that doesn’t shy away from the tougher aspects of prison, particularly for a young violent offender. Recommended.